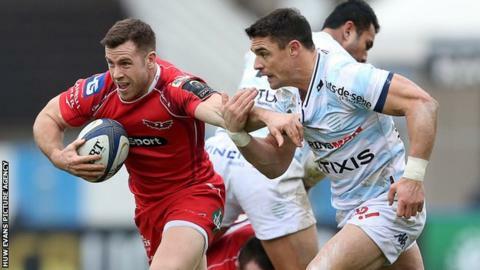 Racing 92 sealed their place in the last eight of the European Champions Cup as they consigned Scarlets to a record defeat in the competition. The Pro12 leaders were outclassed and made to pay dearly for indiscipline as Racing scored nine tries - five of them before half-time. Dan Carter kicked faultlessly for 13 points, with man of the match Casey Laulala scoring a hat-trick of tries. Scarlets' previous biggest loss was 41-0 against Clermont Auvergne in 2008. The visitors were not helped by the last-minute withdrawal of South African second row George Earle with a calf strain, his place taken by Tom Price. And they struggled to hold the home team from the outset as Carter opened his account with a penalty and converted Juan Imhoff's outstanding try. Their resistance collapsed when first Maselino Paulino and then DTH van der Merwe were yellow-carded for dangerous tackles midway through the first half. Tries for former Cardiff Blues centre Laulala and Antonie Claassen quickly followed and, even when Paulino returned, Louis Dupichot ran in brilliantly to claim Racing's bonus point. Laulala's second touchdown on the stroke of half-time came with Scarlets at full strength. Carter did not miss a kick in the first half. After the interval, Scarlets' first-half miscreants combined brilliantly with Paulino sending Van der Merwe over after a storming run, and Gareth Davies crossed soon after with Racing's Mike Phillips in the bin. But a penalty try after a driving maul restored the home dominance, with further tries coming from Imhoff, Johannes Goosen and Laulala. "They're a class side, very strong across the field from one to 15. "But I was disappointed in the early part of that first half. There were 21 points scored when we had men off the field and the game was pretty much gone at that point. "We talked at half-time about putting some pride back in our performance and there were some pretty good things in that second half, but the game itself was obviously gone at half time. So it was very disappointing." Racing 92: Brice Dulin; Louis Dupichot, Dan Carter, Casey Laulala, Juan Imhoff; Remi Tales, Mike Phillips; Eddy Ben Arous, Dimitri Szarzewski (capt), Ben Tameifuna, Luke Charteris, Manuel Carizza, Yannick Nyanga, Bernard Le Roux, Antonie Claassen.